Nearly 20 million Americans attend college each year, and, of those, nearly 60% borrow annually to help cover costs. While many may borrow to pay for tuition, there are challenges associated with debt that may be particularly difficult for students seeking a job after graduation. The Federal Reserve notes that there is roughly $1 trillion in total outstanding student loan debt in the United States. The average debt load for the class of 2012 was $29,400 — up from an average of $26,600 in 2011. 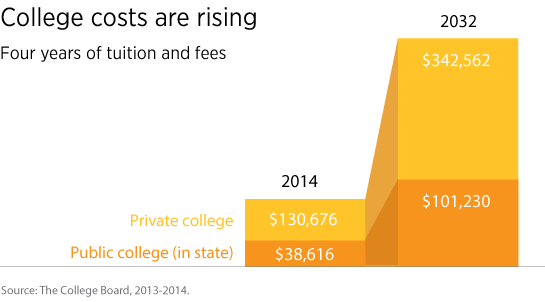 These numbers continue to increase due to the rising cost of college. In addition, tuition inflation compared with general inflation is substantially higher. According to The College Board, the average tuition increase in the 2013-2014 academic year was 3.8% at private colleges and 2.9% at public universities. College costs can require a substantial amount of savings and planning should begin as early as possible. Advisors can help savers understand the benefits of different savings vehicles, such as a 529 plan, and recommend strategies that can help them navigate through the financial aid process and tackle post-graduate student loans.